HydroRanger 200 is an ultrasonic level controller for up to six pumps and provides control, differential control and open channel flow monitoring. For water authorities, municipal water and wastewater plants, HydroRanger 200 is an economical, low-maintenance solution delivering control efficiency and productivity needed to meet today’s exacting standards. It offers single-point monitoring with all models, and optional dual-point monitoring with 6 relay model. As well, it has digital communications with built-in Modbus RTU via RS-485. The standard 6 relay HydroRanger 200 will monitor open channel flow and features more advanced relay alarming and pump control functions as well as volume conversion. It is compatible with SIMATIC PDM, allowing for PC configuration and setup. Sonic Intelligence® advanced echo-processing software provides increased reading reliability. 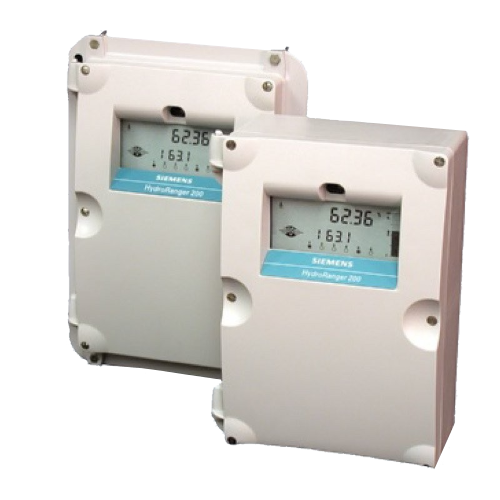 The optional 1 or 3 relay models provide accurate level measurement functions only; these two models do not provide open channel flow, differential level measurement or volume conversion functions. HydroRanger 200 uses proven continuous ultrasonic echo ranging technology to monitor water and wastewater of any consistency up to 15 m in depth. Achievable resolution is 0.1% with accuracy to 0.25% of range. Unlike contacting devices, HydroRanger 200 is immune to problems caused by suspended solids, harsh corrosives, grease or silt in the effluent, reducing downtime. HydroRanger 200 ultrasonic level controller for up to six pumps – control, differential control, and open channel flow monitoring.